Surely only Enid Blyton's Famous Five knocked on the doors of remote farmhouses to visit secret caves hidden behind? This can't be real, you will tell yourself. This is the stuff of adventure stories from another age - yet it can be relived here time and again at this most delightful of caverns. This is Bruntscar Cave - and it is one of those places that will stick in your mind forever. This is all that remains of the barn today: crumbling walls and mullioned windows, yet the farmer has never completely destroyed it, as if aware of its historical importance. Parts of it hang on, refusing to go ... keeping the spirit of Mr. Kidd with them. 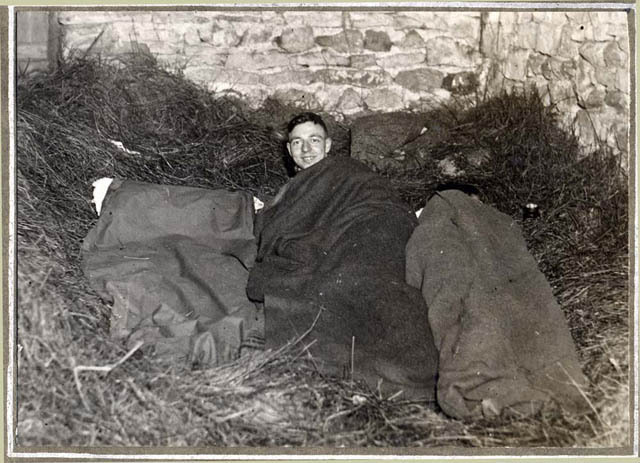 It was a different story on New Year's Day, 1930, when members of the Leeds Caving Club celebrated New Year in the barn, sleeping rough on the hay inside. This picture shows the same two windows as the modern version above it: a scene of innocent happiness now crumbling away forever. There was no glass in those windows: it must have been freezing! The bottom right corner of the barn as it is today, with fallen beams and crumbling walls. 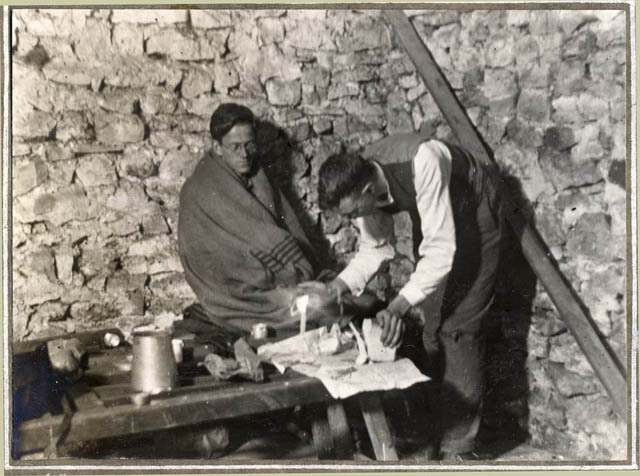 This picture was just possibly taken in that same corner - showing two cavers cooking breakfast. Has the man behind just been caving - or is it his attempt at wearing a dressing gown? 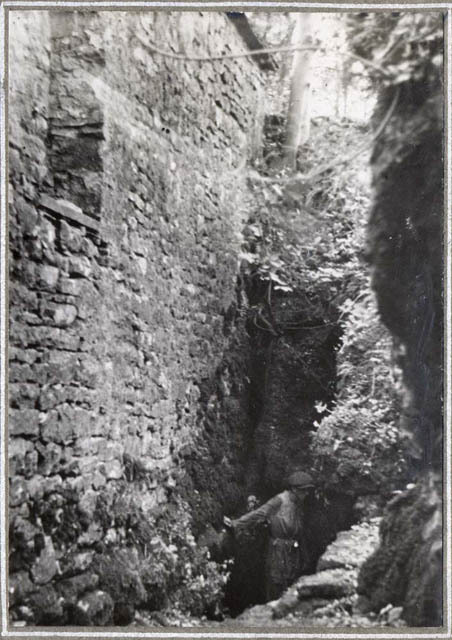 The narrow horizontal stone slab level with the top of the bench can, I think, be matched with one just above the bottom left corner of the 'modern' photograph. The one remaining solid wall of the barn, where the men slept. 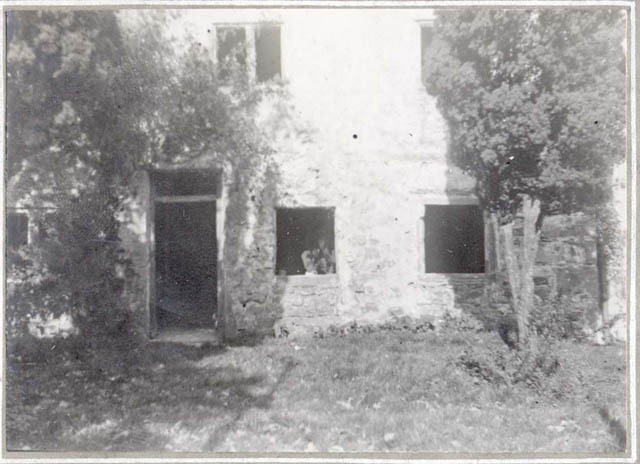 This photograph shows the back of the hall built against the scar. The cave is situated in the dark shadows at the centre, beneath the remaining section of barn wall. Mr. Kidd was so excited by his discovery that he immediately determined to open Bruntscar as a showcave. The fact that it was miles from anywhere didn't seem to bother him. He blasted the entrance to make it slightly bigger, levelled the floor so that Victorian ladies could enjoy the first few yards, and then came his master plan. James Carr, writing in 1876, stated that, 'there are plans to render it comfortably accessible to all classes of sightseers. It is also under consideration to make such improvements that the stream may be turned on or off at pleasure.' Only a genius could dabble with nature like that, of course, and Mr. Kidd failed. Never could he enter his beloved cave without getting a wet bottom. This is the same view in 1930, with flat caps, not caving helmets, being the order of the day. Mr. Kidd soon had an iron gate installed to protect the cave, and he started charging visitors an admisison fee. These days the gate remains open, and the farmer merely takes a donation, quaintly placed into a church collection box! This is another world. Where are mobiles and ipods in a place like this? I paid a mere two pounds to enter the promised land today! Looking back from just inside the entrance. In this pool, during the 19th century, lived a local legend in the form of a tame trout who fed from the hands of visitors. He was so well known that he appeared in various books of the time. One story relates how, after a flood, he was accidentally scooped up in a bucket of water by a farm lady and, when realising the water was about to be boiled on the farmhouse fire, he jumped out onto the hearth rug and saved his scales!! He returned to the pool to live the rest of his fishy life in peace. The first section of passage has been widened by Mr. Kidd. Boulders litter the floor and there is the sound of roaring water in the depths of the hillside. The pulse quickens ..
Fifty yards in, the first of the cave's wonderful formations presents itself as a flowstone 'beehive' which is brushed past on a right hand bend. Here is the feature in close-up. The nature of the cave then changes and it becomes a stunning tear-drop shaped passage, where the stream has hollowed out a major joint. This is classed as one of the finest pieces of stream passage in Yorkshire, and yet it is so easy to reach. A hands and knees crawl through this shallow pool is then on the cards as an approach is made to the first waterfall chamber. We now meet the main stream itself. Most of it vanishes in the right hand wall of the chamber, but to the left we meet the famous double cascade, and the feature named by Mr. Kidd as 'The Font.' The rock glistens with colour making a lovely scene. Experience the noise and wonder of this active stream cave. Looking up the second of the 'twin' cascades from the font. In the wettest conditions this can be a dangerous torrent. It was nice and friendly today. 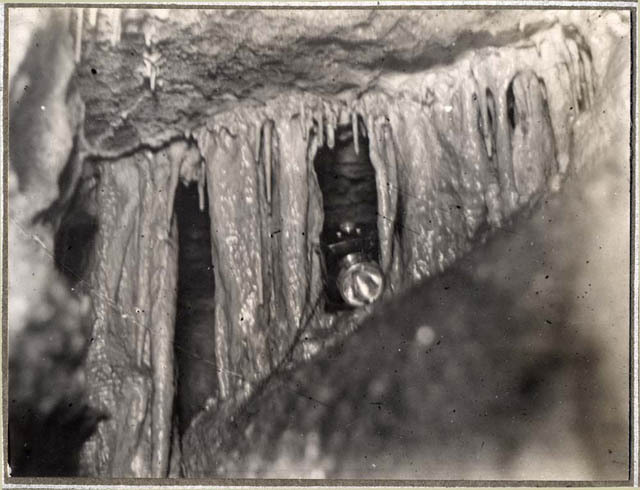 Mr. Kidd described an 'organ' in the cave, 'which, when gently struck by a finger, produces varied musical tones.' I wonder if this was it? Climbing up into the font and carrying on up the narrow passage is really exciting. Here we meet another waterfall, with the rock behind resembling a gaping mouth. Not as many of the earlier visitors braved it this far as many would have wet their bloomers. A result of this is that the formations just get more and more impressive. 'I am the Walrus.' This is where Bruntscar Cave changes from pretty to truly beautiful. By wedging yourself into the passage at the second fall, you can shuffle up ten feet or so into the 'belfry' where Kidd imagined a peal of bells hanging over the church below. I love to look at Lewis Carroll's 'Walrus' here, his huge arched body of flowstone pillows dominating the suspended chamber. Kidd also mentioned, up in the ceiling, a sphinx and a devil. Surely this bizarre figure must be one of them? Here's another possible 'font': a gour pool beautifully situated beneath the body of the crouching walrus. Just below the head of the walrus is this lovely mass of golden flowstone, seemingly pouring like molten lava from the belfry. One of the original named features of the cave was described as John Bull (a beefy personification of Great Britain) guarding a mountain pass. Could this be the pass in question? And is that massive face on the wall right of centre Mr. Bull himself, with long nose and rubbery lips? There are many delicate stalactites and grottos to enjoy, almost everywhere you look. Stalactites are quite easily explained. Rain water seeping through the soils is enriched in carbon dioxide and so dissolves a large amount of calcite from the limestone. As it drips through into the open cave the carbon dioxide diffuses into the air and the calcite is then re-deposited or, correctly re-precipitated. Technical stuff, but you need to know it if you love limestone. You can see the immensely slow process going on here. Side chambers and gour pools are in evidence throughout the cave, at a higher level, and are too delicate to explore. The passage gets narrower and occasionally drops so that you must pluck up the courage to crawl on hands and knees ... but it's worth it. Golden flowstone features really come into the ascendancy along this part of the cave passage. Ancient features they may be, but the impression is of newly sculpted works of art, and Bruntscar has them by the hundred. Stalactites follow the jointing in the ceiling, where water manages to find its way through into the cave. Stunning curtains of flowstone have been built up on the walls over many centuries - a typical feature of active caves in the Yorkshire Dales. In places, the flowstone curtains meet, requiring a stoop below. All cavers should be careful not to brush too heavily against features like this. It is a delicate environment. Further examples of flowstone features in the upper reaches of Bruntscar Cave. 'The Hand in Glove'. Crawling under it makes every part of the anatomy get wet. From this point on, it's all hands and knees in water: a sensible place to turn back and enjoy it all again. The climax of the cave is this wonderful set of pillars, formed over many thousands of years where stalactites and stalagmites have joined. Delicate stalactites are forming in between. Here's a closer look. One stalactite left of centre resembles a young carrot. And here's the exact same view 83 years ago, with the Leeds Caving Club popping their camera in the gap. Generations have since grown up and become grandparents, even great grandparents - yet take a look at the 'carrot'. In 83 years, there's been no visible change - a mere indication of just how old these amazing features must be. This gorgeous 'gour chamber' at roof level was one of the highlights of the return journey. Cavers have sensibly left it well alone, as can be seen from the surviving stalactites. More stalactites and pillars at roof level. Massive 'pipes' of flowstone decorate the upper reaches of the stream passage. And here's a surfacing Mermaid: her head out of the water, arms outstretched, and fishy tail swirling into the depths. Beautiful. The 'Crab's Claw', remarkable in both form and colour, is another feature best noticed on the return journey. Put your own name to this one. My powers of imagination have desserted me! Silver wands and delicate sceptres hang from the ceiling on the way out. Follow me out. I'm six feet four and my back was creasing by this stage! The head of this old bed has been guarding the cave entrance for years on end, giving it an even greater sense of mystery. I wonder if Mr. Kidd slept in this? Exiting through the ruins of the barn. Is it true that, minutes before, you were in another world? Bruntscar hall is reached by taking Philpin Lane on the opposite side of the road to the Hill Inn (past the Three Peaks snack bar). Follow the lane to a junction beneath Whernside, and turn left. The hall is easily recognised by its 1689 date-stone. If the farmer isn't in, please call at the farm next door but watch out for the protective terriers (the lady is nice and sorts them out). Offer a donation which is given to St. Leonard's church. This is an active stream cave. Enter only in settled weather, preferably during a dry spell. Never enter in rain. Lamps and wellies are available for hire in Ingleton. Do not rely on a torch if you intend to go beyond the first waterfall. Take a change of clothes in your car. Properly equipped, junior age children will love this cave. The first waterfall is the trickiest and smaller people may need a 'hand up'. There's no chance of getting lost as this is just a single passage, but you will get very wet indeed!! Enjoy this wonderful adventure, but most of all, stay safe and please respect the lovely formations in this special place. Hi - many thanks. It would be great if they could re-create the original barn. I don't know if anyone has a plan to - needs someone with a lot of money to buy it in the future but then they might deny access. It's a super little place and a hidden gem really. Sorry for taking so long to get back ... just keep checking through to notice comments and must have missed this one. Much appreciated! I absolutely love your pic's, your little videos and your interesting, informative and FUNNY comments! Thank you, wow what an adventure, I can't wait to see your other postings! P.S. this comment may say Ray (my husband)I've been trying hard for 20 min. to change it to me (Rhonda Jean) but - no success (not very skilled on here) Thank you for sharing!